This, for me, is it. This is the one. The chocolate cake of all chocolate cakes. 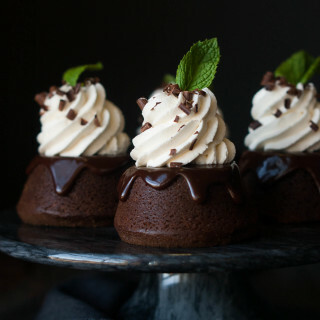 I don’t think I could dream of a more perfect combination than smooth, dense chocolate mousse sandwiched between a soft, dark chocolate layer of cake and rich chocolate ganache. I’ve even taken it up a notch by adding a swirl of white chocolate mousse and beautiful red pomegranate seed accents. Wouldn’t this be the perfect dessert to end your Christmas dinner with? You must admit, it does look quite festive, what with the wreath like mound of white chocolate mousse topping it and all that. 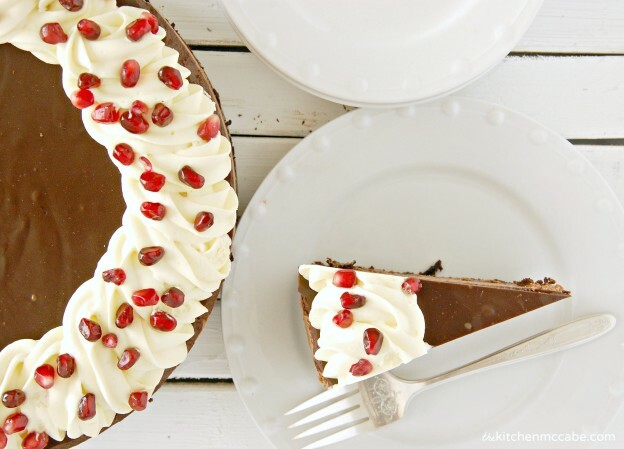 And pomegranate seeds just scream HOLIDAYS!, don’t you think? 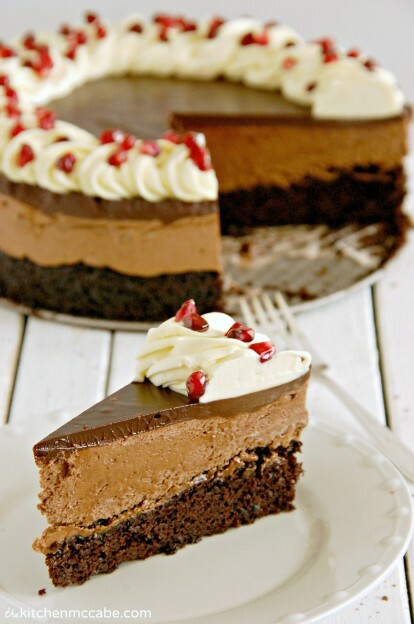 Just a little bit of espresso powder gives the chocolate cake layer a deep, dark, rich color as well as doing the same for the flavor. 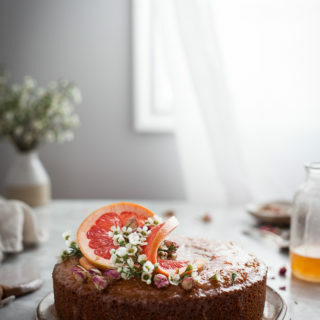 I like to use coconut milk in my cakes in place of cows milk, not only to reduce the amount of dairy in the cake, but coconut milk makes the cakes softer, as well as a bit more dense, which I prefer. You can use canned coconut milk, or the refrigerated kind that comes in a half gallon. I’ve used both and either will work just fine. I tend to use the kind packaged for drinking more often, just because I usually have it around since we don’t drink cows milk and coconut has made a great substitute for most recipes using milk. Nope, this is not a simple, easy dessert and will take a few hours to make. And to me, those desserts are the desserts worth putting some time and effort into. I’m sharing this recipe over at my cute friend Jonie’s awesome blog just-between-friends today! 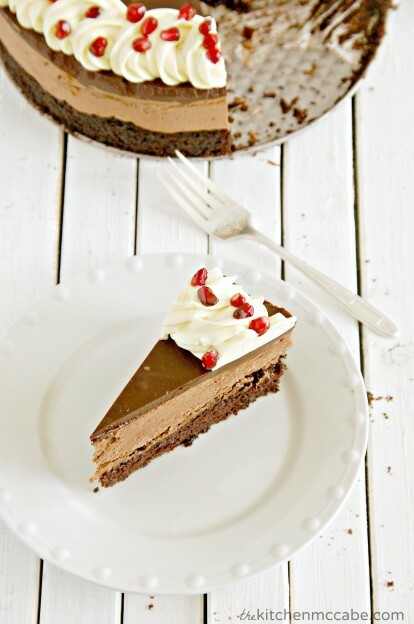 So head over here to get the chocolate mousse recipe! Preheat the oven to 350 degrees. Line the bottom of a 9" Springform pan with parchment(trace and cut to fit) and lightly grease. Place flour, sugar, cocoa, baking powder, baking soda, salt, and espresso powder in a mixing bowl and mix until blended together. Add the coconut oil, egg, coconut milk, and vanilla to the dry ingredients and mix just until combined. Add the hot water to the mixture and mix until combined, 10-15 seconds. Bake for 15-20 minutes, or until the top of the cake is firm but springs back when touched. 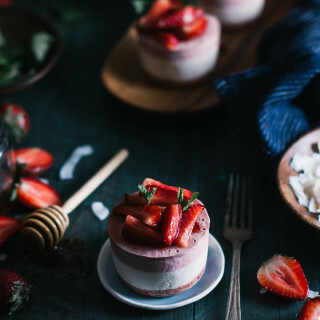 Run a knife around the edge of the cake and remove the springform, simply to make sure it will come apart from the cake portion easily when unmolding the whole chilled mousse cake. Re-attach the springform to the cake portion. Grease the sides of the pan lightly with oil or cooking spray. Make the chocolate mousse according to directions. Spoon the chocolate mousse on top of the cooled chocolate cake in the springform pan and smooth out the top so that its level. 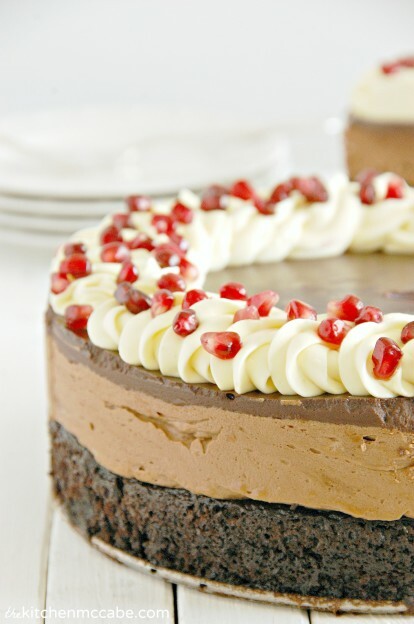 Place the mousse cake in the fridge while you prepare the ganache. Place 1 C. dark chocolate chips and ½ C. heavy cream in a microwave safe bowl and microwave for 1 minute. Whisk the chocolate and cream together until smooth(microwave for an additional 30 seconds if there are lumps). Add the butter and vanilla to the ganache and whisk until butter melts and mixture is smooth. Refrigerate the cake while you make the white chocolate mousse. Heat ⅓ C. of the cream in a small saucepan. In a separate bowl, whisk together the egg yolks, sugar, and a pinch of salt until combined. Pour the hot cream into the egg yolk mixture, whisking constantly, until combined. Transfer the egg mixture back into the saucepan used to heat the cream. Cook over medium/low heat, stirring constantly, until the mixture begins to boil and thickens. Remove from the heat and whisk in the white chocolate chips and vanilla. Whisk until the white chocolate melts and mixture is smooth. Whip the remaining ⅔ C. heavy cream to stiff peaks. Whisk a spoonful of the cream into the white chocolate mixture to lighten. Add the remaining whipped cream and fold in gently until the mixture is combined, but still light and fluffy. Spoon the mixture into a large pastry bag fitted with a large star tip. Pipe swirls of white chocolate mousse all the way around the perimeter of the cake. 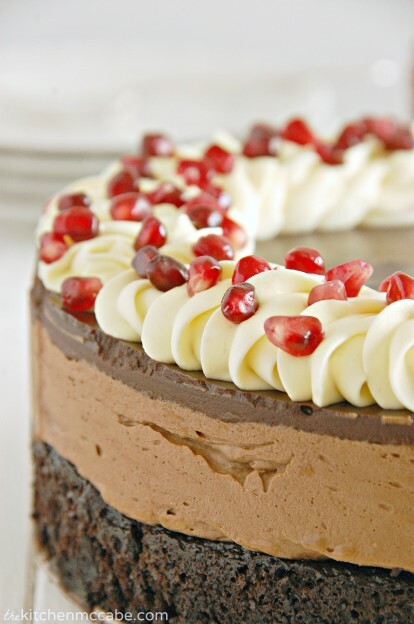 Sprinkle pomegranate seeds evenly over the white chocolate mousse. Chill for at least 4 hours, or until the mousses are firmly set. TO SERVE: Carefully unmold the mousse cake from the springeform pan. It should come off smoothly if you greased it well before adding the mousse. Cut the cake with a knife dipped in boiling hot water(then wiped off) for a smooth cut. « Gingerbread Marshmallow Hot Chocolate Sticks with Printable Tags!